iPad Blogging App 'Posts' Goes Free! 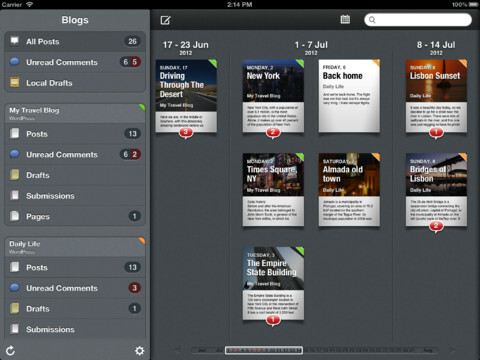 iPad Blogging App ‘Posts’ Goes Free! News can crop up anytime and when it does you need to be ready to post, so there’s no better device to have handy than an iPad. The iPad makes posting news a breeze – or at least should do. The official WordPress App on the iPad is bad to put it nicely, it lacks some of the key functionality posting through the website equivalent does, and just doesn’t feel or look good. That goes for many of the other blogging Apps I have tried over the years on the iPad. The exception to this is Posts, which is a fantastic App, but priced at $9.99 was a little pricey, but the good news is the developers have just announced they are releasing it for free. The Blogging App offering the best way to manage your blogs on the iPad, brought to you by Apple Design Award winning Pico, original creators of Versions app for the Mac. Whether you want to make the management of a single blog easy on the iPad, or you want a powerful workhorse that lets you manage your collection of multiple blogs on one spot, Posts app is the right tool for you. When multiple blogs are set up in Posts, you’ll be able to quickly check at a glance what’s going on in every single one of them. The built-in post editor is powerful and easy. If you’ve ever used word processing apps before, you will feel right at home. Adding images and videos to your posts is a piece of cake. If you need to touch up the resulting HTML code, you can do that too. When it’s time to wrap it up, if you are not ready to send the new changes to your blog just yet you can save them only to your iPad as a local draft. These local drafts can be sent to your blog later, whenever you are ready. The move to a Free App seems to be permanent with the developers taking to Twitter to reveal the good news and also confirm that the reasoning behind the reduction in price was to get Posts in the hands of more people. Whilst the reduction seems a permanent move, as mentioned, you never know if the developers may change their mind so hurry up and click the link below to download your copy now and experience the best blogging App on the iPad.